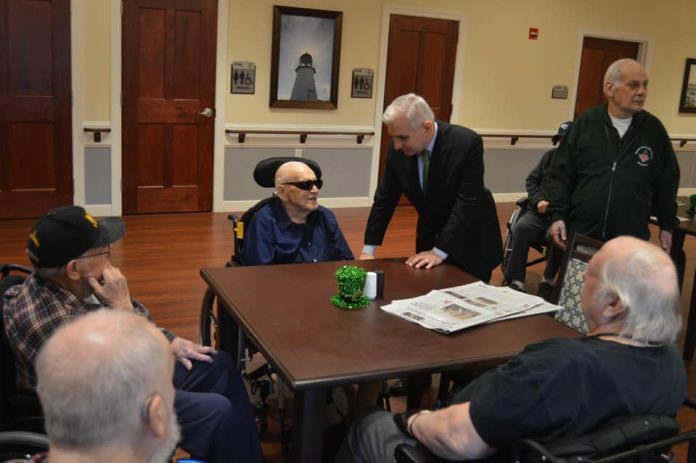 BRISTOL – On March 15, Sen. Jack Reed, D-R.I., a former U.S. Army Ranger, visited the Rhode Island Veterans Home in Bristol, underscoring his efforts to boost veteran medical services and community care. Reed, a member of the Senate Appropriations Subcommittee on Military Construction and Veterans Affairs, is calling for funding for more doctors, nurses and U.S. Department of Veterans Affairs facilities, to care for veterans and deliver the benefits they have earned. Reed helped pass $86.5 billion for services for veterans in the fiscal year 2019 Military Construction and Veterans Affairs Appropriations law – an increase of $5 billion over the prior year. Reed helped pass the VA Mission Act, which became law in June and extends eligibility to the Department of Veterans Affairs’ Caregiver Assistance Program to aging and disabled veterans injured before Sept. 11. It also enhances the department’s ability to recruit, hire and retain medical personnel. Also, as a member of the Senate Appropriations, Transportation, Housing, Urban Development Subcommittee, Reed delivered $4 million for the Veterans Home Rehabilitation and Modification Pilot Program in the 2019 Appropriation law. These funds will be used to help repair or modify the homes of more than 260 low-income veterans with disabilities.